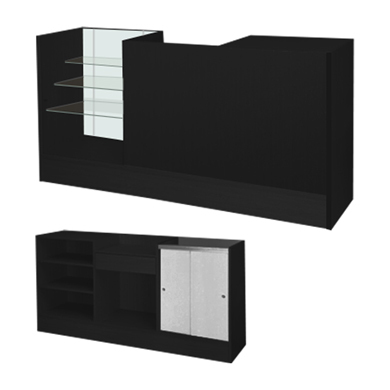 The All-in-One Counter system is a complete unit including a glass front display, service counter and register stand. This showcase for retail features an closed front glass area with 1 glass shelf. Service counter is 24 in. W with 2 adjustable wood shelves. Register stand is 24 in. W and includes drawer. For many more offerings, we invite you to take the opportunity to explore our comprehensive range of showcases for retail at Specialty Store Services today.